Bash has several commands that comes with the shell (i.e built inside the bash shell). When you execute a built-in command, bash shell executes it immediately, without invoking any other program. Bash shell built-in commands are faster than external commands, because external commands usually fork a process to execute it. 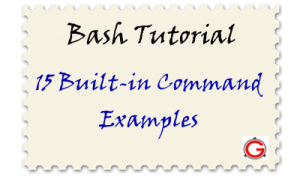 In this article let us review some useful bash shell builtins with examples. export command is used to export a variable or function to the environment of all the child processes running in the current shell. export -f functionname # exports a function in the current shell. It exports a variable or function with a value. “env” command lists all the environment variables. In the following example, you can see that env displays the exported variable. “export -p” command also displays all the exported variable in the current shell. eval command combines all the given arguments and evaluates the combined expression and executes it, and returns the exit status of the executed command. proccomm="ps -e -o pcpu,cpu,nice,state,cputime,args --sort pcpu | grep $1"
proccomm="ps -e -o pcpu,cpu,nice,state,cputime,args --sort pcpu"
The above code snippet accepts an argument, which is the pattern for a grep command. This lists the processes in the order of cpu usage and greps for a particular pattern given in the command line. Note: This article is part of our on-going Bash Tutorial Series. hash command maintains a hash table, which has the used command’s path names. When you execute a command, it searches for a command in the variable $PATH. But if the command is available in the hash table, it picks up from there and executes it. Hash table maintains the number of hits encountered for each commands used so far in that shell. You can delete a particular command from a hash table using -d option, and -r option to reset the complete hash table. readonly command is used to mark a variable or function as read-only, which can not be changed further. shift command is used to shift the positional parameters left by N number of times and renames the variable accordingly after shifting. -t) echo "Hash Table command"
test command evaluates the conditional expression and returns zero or one based on the evaluation. Refer the manual page of bash, for more test operators. echo "The positional parameter \$1 is empty"
getopts command is used to parse the given command line arguments. We can define the rules for options i.e which option accepts arguments and which does not. In getopts command, if an option is followed by a colon, then it expects an argument for that option. getopts provides two variables $OPTIND and $OPTARG which has index of the next parameter and option arguments respectively. h) echo "help of $OPTARG"
r) echo "Going to remove a file $OPTARG"
to the normal information; the -p option lists process id's only. Logout built in used to exit a current shell. umask command sets a file mode creation mask for a current process. When an user creates a file, its default permission is based on the value set in umask. Default permission for file is 666, and it will be masked with the umask bits when user creates a file. For more details please refer our article File and Directory permissions. When user creates a file 666 is masked with 022, so default file permission would be 644.
set is a shell built-in command, which is used to set and modify the internal variables of the shell. set command without argument lists all the variables and it’s values. set command is also used to set the values for the positional parameters. $ set +o history # To disable the history storing. +o disables the given options. In the above example, after unset the variable “var” will be assigned with null string. let commands is used to perform arithmetic operations on shell variables. shopt built in command is used to set and unset a shell options. Using this command, you can make use of shell intelligence. Before enabling xpg_echo option, the echo statement didn’t expand escape sequences. “l.” is aliased to ls -l of current directory. After disabling expand_aliases option in shell, it didn’t expand aliases, you could notice an error l. command not found. Similar to printf in C language, bash printf built-in is used to format print operations. In example 13, the script does arithmetic operation on two inputs. In that script instead of echo statement, you can use printf statement to print formatted output as shown below. In arith.sh, replace the echo statement with this printf statement. I am a beginner and trying to learn things. can some one please explain me example 6. I did’nt got how “analysis break testing t1.sh temp” will print. And also example 8. Not sure where $OPTIND will be used. Thanks for all the useful tips. The first positional parameter is “z” there is no match. So the loop will exit. getopts is used in the example 8 to parse the different switches. For e.g. the command “ls” has a switch like ‘l’ and ‘t’. I guess you can do the same thing using the method mentioned in the example 6. I did not understand the umask tip 10. @Shantanu Thank you very much for your explanation. It really helped me. This article really proved to be very useful..
don’t know what the problem is. i tried different options, the result is always the same. as u metioned, getopts provides two variables $OPTIND and $OPTARG which has index of the next parameter and option arguments respectively. But how to explain in the code you gave the $OPTIND ?